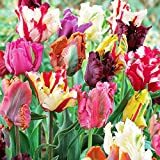 Tulipa agenensis growing geophyte of the genus Tulipa also known as Tulip agenensis, Tulipa agenensis perennial deciduous used as ornamental plant, can grow in mediterranean climate and growing in hardiness zone 7-11. Leaves color green that grow from the bulb in lance shape. Parrot Mix Tulip Bulbs - Tulipa Parrot! 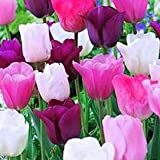 50 Purple Rain Mix Tulip Bulbs - Tulipa Triumph: Super-Sized X-tra Value Bag!